Located in the Southeastern Bahamas, fishing for Blue Marlin in Cat can be one of the most rewarding experiences of a lifetime. Typically you will fish close to shore, as the drop off is less than a mile away. Fishing for Blue Marlin on Cat Island can at times be a bit boring, but when the bite hits it is spectacular. Typically your crew will deploy a spread of either artificial lures or dead baits. Both Columbus Point, and Devils point are great places to try to catch Blues on Cat Island. Almost always, bridge teasers are deployed and pitch baits are at the ready for a Blue Marlin that crashes a teaser. At that time the captain will pull the teaser away from the fish, while the deckhand will drop a rigged dead bait (usually a mackerel or horse ballyhoo) back to the attacking billfish. The captain will work the drop-off from 500 feet out to depths of 5000 feet, trying to find where the marlin are feeding and traveling. 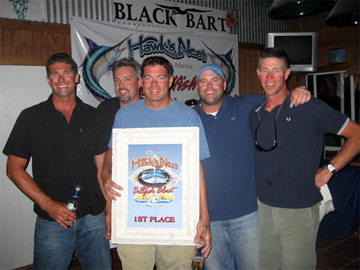 Often they will be right in on the edge chasing bait such as blackfin tuna, skip-jack tuna and small dolphin. When deploying artificial lures, often you will see a five lure spread. Two Short Rigger Lures, Two Long Rigger Lures, and a Center Rigger Lure. Along with two teasers and some pitch baits, you are now Blue Marlin Fishing in the Bahamas. Cat Island Tuna & Wahoo Fishing is some of the best in the world! When not fishing for Marlin you'll find Wahoo, Tuna & Dolphin to keep you busy. Just watch out for the Sharks as they are aggressive here! The Wahoo grow VERY large here. 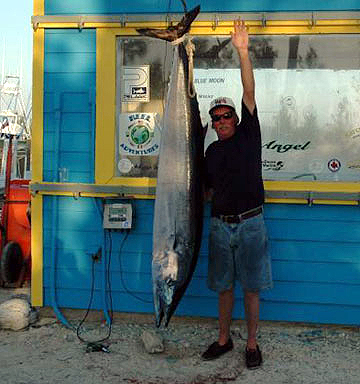 Over Under Adventures caught a 148lb wahoo a few years ago and that was only four pounds short of the world record at that time! The photo top left is the 148 pound slob wahoo that the OVER UNDER ADVENTURES crew caught a couple years ago, right out at Columbus Point! Be sure to check out the 117# Wahoo that the Over Under guys caught with George Poveromo this past season while Fishing San Salvador! 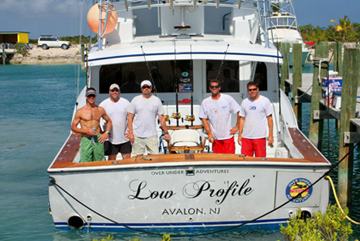 Give the Guys at Over Under a call to learn everything there is to know about fishing out of Cat Island, or anywhere in that part of the Bahamas for that matter!